We prefer everything in online marketing including Social Media Optimization to bring best business result for you. Social Media improves brand and visitor’s involvement. We support you to make an effective plan for your commerce and attract new customers. Today, many people prefer to buy products from a brand they know through social networking sites (Twitter/Facebook). Even these social networking sites are also used for businesses and above 50%, people suggest products to their friends in tweeter. Equivalent Facebook witness billions of users across the world and almost millions of people see videos on You Tube. Almost 70-80 % of people are associated with these social networking sites. These interest shows that people loves to do online shopping and now you can know that social media is a great platform to showcase your products/services and appeal users to purchase them. By some tactics and impressive content, you can gain popularity and improve online status. If you want to grow your commerce, you have to maintain an online presence that builds bridge between you and your clients. At Webic Studio, we assist you in developing your social image and encourage users to stay for long time on your website to shop. 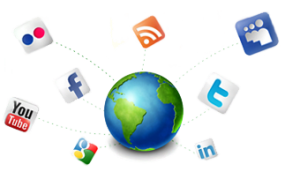 Our professionals do necessary research for your business and try to get benefit from these social networking sites. Social Media Optimization creates your services/products live to many social networks such as – Facebook, Twitter, Google+ and Linked In. Like this, you can make bigger frame of contents and increase your online visibility. By spreading your product/service information, you can connect with people around the globe and grow your online presence. Visibility of the website will be marked as it gets reviews and attract viewer’s engagement. There are many benefits of social media marketing and an effective plan can increase the ranking and bring traffic on your website. It is also a great way to advertise your services/products to users across the world. Social Media support your business and increase the value of your services or products. By posting attractive content, you can get popularity and will be doing well in developing the image of your brand. In this way, you will be able to endorse your product in the world.